This is the original Little Angel page on the Cumbrian Castle Blog. 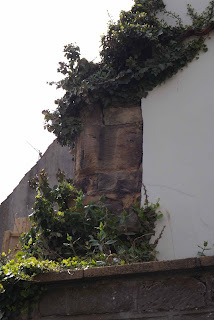 A recent walk around Whitby presented me with the following two views of what looks like some sand stone masonry hidden amongst the vegetation of the pub gardens. It looks as if the rendering has been removed at some point, possibly indicating that this piece of stone work continues both to the left and to the right. What it represents though, I've no idea, though there are faint indications of some sort of decoration. 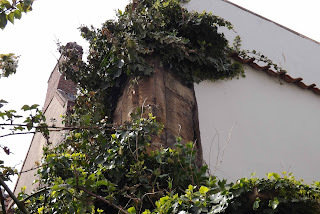 Is this further proof perhaps that a much older building still remains hidden beneath the current building?